If you are a business owner, you know what an eyesore graffiti can be and how maddening it is to arrive at work in the morning only to find that vandals have caused extensive damage to your property overnight. 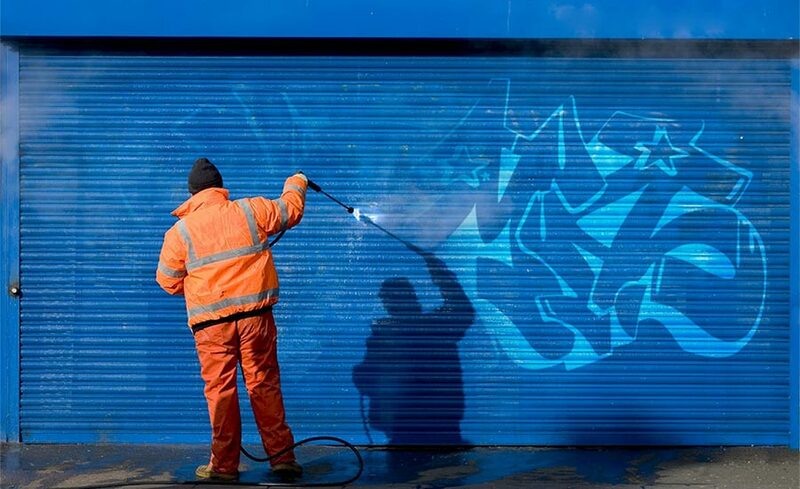 Graffiti isn’t easy to remove; it often requires a combination of sandblasting and pressure washing, which both make use of specialised equipment. However, it is essential to remove graffiti as quickly as possible, and that’s where professional graffiti management services come in. Here are the benefits of professional graffiti management and how Jani-King can help protect your business. Potential and existing customers make judgments about your business extremely quickly. If they pull up and see a building covered in graffiti, they’re naturally going to form negative opinions of your business, even though they most likely aren’t accurate. That’s human nature, so it’s important to always keep your property looking its best. Graffiti management services help ensure that your building and property look attractive, neat, and clean so that your customers see your business as well-managed. Which means that if you want your business to thrive, fast graffiti removal is a must. Graffiti does more than harm your reputation; it can also damage your building. Exterior paint is specially formulated to protect against the elements, and the spray paint typically used by vandals can weaken this layer of protection. Worse, the longer you leave the graffiti in place, the deeper it can sink into the surface of your building, causing extensive damage over time. That’s one reason removing graffiti as soon as possible is essential. As mentioned above, graffiti causes damage to buildings and other structures. Business owners face extensive long-term costs if they don’t remove the graffiti quickly, both in property damage and declining property value. The appearance of your property affects its value, so keeping it in good shape is imperative to protect your investment. An additional cost related to graffiti: the longer you allow spray paint to remain on your building, the harder and more expensive it becomes to remove. A little graffiti will attract more graffiti. Keeping your building clean and free from the signs of vandalism can help keep away more acts of vandalism in the future. Removing graffiti immediately also sends the message to taggers that your area is a waste of time since their artwork will disappear within a day or two. Graffiti management protects your business, your community, and the people in the neighbourhood. If you’re already a Jani-King client, you’re aware of the benefits of our commercial cleaning services. Take your satisfaction and convenience to the next level by adding some of our other professional services including graffiti management, waste management, pest control, carpark cleaning, high façade cleaning, and more. No matter how many services you choose, you’ll still only have one point of contact, one invoice, and the same outstanding service. Contact us today to discuss your needs.